^ Rogozinski 1999, pp. 85, 116–118, 133, 158, 164–167, 169. ^ a b c Rogozinski 1999. ^ Rogozinski 1999, pp. 85, 116–117, 164–165. ^ Rogozinski 1999, pp. 164–165. ^ a b c d Knight, Franklin W. (1990). The Caribbean: The Genesis of a Fragmented Nationalism (2nd ed.). New York: Oxford University Press. pp. pp 204-208. ISBN 0-19-505441-5. ^ Rogozinski 1999, p. 167. Rogozinski (1999). A Brief History of the Caribbean. New York: Facts on File, Inc.. ISBN 0-8160-3811-2. Dubois, Laurent. Avengers of the New World: The Story of the Haitian Revolution. Cambridge, Mass. : Belknap Press of Harvard University (2005) ISBN 0-674-01826-5. Dubois, Laurent & Garrigus, John D. Slave Revolution in the Caribbean, 1789?1804: A Brief History with Documents. Bedford/St. Martin's Press (2006) ISBN 0-312-41501-X. Garrigus, John D. Before Haiti: Race and Citizenship in Saint-Domingue. Palgrave-Macmillan, (2006) ISBN 1-4039-7140-4. 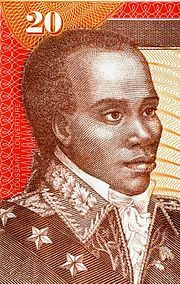 Geggus, David P. Haitian Revolutionary Studies. University of South Carolina Press, (2002) ISBN 1-57003-416-8. C・L・R・ジェームズ The Black Jacobins: Toussaint L'Ouverture and the San Domingo Revolution. Vintage, 2nd edition, (1989) ISBN 0-679-72467-2. Ott, Thomas O. 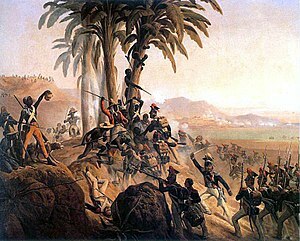 The Haitian Revolution, 1789-1804. University of Tennessee Press, 1973. Peyre-Ferry, Joseph Elysee. Journal des operations militaires de l'armee francaise a Saint-Domingue,1802-1803 (2006), ISBN 2846210527.